Six orbiters were built for flight: Enterprise, Columbia, Challenger, Discovery, Atlantis, and Endeavour. All were built in Palmdale, California, by the Pittsburgh, Pennsylvania-based Rockwell International company. The first orbiter, Enterprise, made its maiden flight in 1977. An unpowered glider, it was carried by a modified Boeing 747 airliner called the Shuttle Carrier Aircraft and released for a series of atmospheric test flights and landings. Enterprise was partially disassembled and retired after completion of critical testing. The remaining orbiters were fully operational spacecraft, and were launched vertically as part of the Space Shuttle stack. Columbia was the first space-worthy orbiter, and made its inaugural flight in 1981. Challenger, Discovery, and Atlantis followed in 1983, 1984 and 1985 respectively. In 1986, Challenger was destroyed in an accident shortly after launch. Endeavour was built as Challenger's replacement, and was first launched in 1992. In 2003, Columbia was destroyed during re-entry, leaving just three remaining orbiters. Discovery completed its final flight on March 9, 2011, and Endeavour completed its final flight on June 1, 2011. Atlantis completed the last ever Shuttle flight, STS-135, on July 21, 2011. In addition to their crews and payloads, the reusable orbiter carried most of the Space Shuttle System's liquid-fueled rocket propulsion system, but both the liquid hydrogen fuel and the liquid oxygen oxidizer for its three main rocket engines were fed from an external cryogenic propellant tank. Additionally, two reusable solid rocket boosters provided additional thrust for approximately the first two minutes of launch. The orbiters themselves did carry hypergolic propellants for their RCS thrusters and Orbital Maneuvering System engines. The Space Shuttle orbiter resembled an airplane in its design, with a standard-looking fuselage and two double delta wings, both swept wings at an angle of 81 degrees at their inner leading edges and 45 degrees at their outer leading edges. The vertical stabilizer of the orbiter had a leading edge that was swept back at a 45-degree angle. There were four elevons mounted at the trailing edges of the delta wings, and the combination rudder and speed brake was attached at the trailing edge of the vertical stabilizer. These, along with a movable body flap located underneath the main engines, controlled the orbiter during later stages of descent through the atmosphere and landing. Overall, the Space Shuttle orbiter was roughly the same size as a McDonnell Douglas DC-9 airliner. The Reaction Control System (RCS) was composed of 44 small liquid-fueled rocket thrusters and their very sophisticated fly-by-wire flight control system, which utilized computationally intensive digital Kalman filtering. This control system carried out the usual attitude control along the pitch, roll, and yaw axes during all of the flight phases of launching, orbiting, and re-entry. This system also executed any needed orbital maneuvers, including all changes in the orbit's altitude, orbital plane, and eccentricity. These were all operations that required a lot more power and energy than mere attitude control. The forward rockets of the Reaction Control System, located near the nose of the Space Shuttle orbiter, included 14 primary and two vernier RCS rockets. The aft RCS engines were located in the two Orbital Maneuvering System (OMS) pods at the rear of the orbiter, and these included 12 primary (PRCS) and two vernier (VRCS) engines in each pod. The PRCS system provided the pointing control of the Orbiter, and the VRCS was used for fine maneuvering during the rendezvous, docking, and undocking maneuvers with the International Space Station, or formerly with the Russian Mir space station. The RCS also controlled the attitude of the orbiter during most of its re-entry into the Earth's atmosphere – until the air became dense enough that the rudder, elevons and body flap became effective. During the early design process of the orbiter, the forward RCS thrusters were to be hidden underneath retractable doors, which would open once the orbiter reached space. These were omitted in favor of flush-mounted thrusters for fear that the RCS doors would remain stuck open and endanger the crew and orbiter during re-entry. The orbiter crew cabin consisted of three levels: the flight deck, the mid-deck, and the utility area. The uppermost of these was the flight deck, in which sat the Space Shuttle's commander and pilot, with up to two mission specialists seated behind them. The mid-deck, which was below the flight deck, had three more seats for the rest of the crew members. The galley, toilet, sleep locations, storage lockers, and the side hatch for entering and exiting the orbiter were also located on the mid-deck, as well as the airlock. The airlock had an additional hatch into the payload bay. This airlock allowed two or three astronauts, wearing their Extravehicular Mobility Unit (EMU) space suits, to depressurize before a walk in space (EVA), and also to repressurize and re-enter the orbiter at the conclusion of the EVA. The utility area was located under the floor of the mid-deck and contained air and water tanks in addition to the carbon dioxide scrubbing system. Three Space Shuttle Main Engines (SSMEs) were mounted on the orbiter's aft fuselage in the pattern of an equilateral triangle. These three liquid-fueled engines could be swiveled 10.5 degrees vertically and 8.5 degrees horizontally during the rocket-powered ascent of the orbiter in order to change the direction of their thrust. Hence, they steered the entire Space Shuttle, as well as providing rocket thrust towards orbit. The aft fuselage also housed three auxiliary power units (APU). The APUs chemically converted hydrazine fuel from a liquid state to a gas state, powering a hydraulic pump which supplied pressure for all of the hydraulic system, including the hydraulic sub-system that pointed the three main liquid-fueled rocket engines, under computerized flight control. The hydraulic pressure generated was also used to control all of the orbiter's "flight control surfaces" (the elevons, rudder, speed brake, etc. ), to deploy the landing gear of the orbiter, and to retract the umbilical hose connection doors located near the rear landing gear, which supplied the orbiter's SSMEs with liquid hydrogen and oxygen from the external tank. Two Orbital Maneuvering System (OMS) thrusters were mounted in two separate removable pods on the orbiter's aft fuselage, located between the SSMEs and the vertical stabilizer. 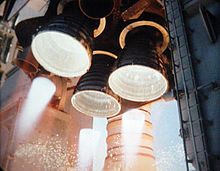 The OMS engines provided significant thrust for coarse orbital maneuvers, including insertion, circularization, transfer, rendezvous, deorbit, abort to orbit, and to abort once around. At lift-off, two solid rocket boosters (SRBs) were used to take the vehicle to an altitude of roughly 140,000 feet. Electric power for the orbiter's subsystems was provided by a set of three hydrogen-oxygen fuel cells which produced 28 volt DC power and was also converted into 115 volt 400 Hz AC three-phase electric power (for systems that used AC power). These provided power to the entire Shuttle stack (including the SRBs and ET) from T-minus 3m30s up through the end of the mission. The hydrogen and oxygen for the fuel cells was kept in pairs of cryogenic storage tanks in the mid-fuselage underneath the payload bay liner, and a variable number of such tanks could be installed (up to five) depending on the requirements of the mission. The three fuel cells were capable of generating 21 kilowatts of power continuously (or a 15-minute peak of 36 kilowatts) with the orbiter consuming an average of about 14 kilowatts of that power (leaving 7 kilowatts for the payload). Additionally, the fuel cells provided potable water for the crew during the mission. The orbiter's computer system consisted of five identical IBM AP-101 avionics computers, which redundantly controlled the vehicle's on-board systems. The specialized HAL/S programming language was used for orbiter systems. The orbiters were protected by Thermal Protection System (TPS) materials (developed by Rockwell Space Systems) inside and out, from the orbiter's outer surface to the payload bay. The TPS protected it from the cold soak of −121 °C (−186 °F) in space to the 1,649 °C (3,000 °F) heat of re-entry. The orbiter's structure was made primarily from aluminium alloy, although the engine thrust structure was made from titanium alloy. The later orbiters (Discovery, Atlantis and Endeavour) substituted graphite epoxy for aluminum in some structural elements in order to reduce weight. The windows were made of aluminum silicate glass and fused silica glass, and comprised an internal pressure pane, a 1.3-inch-thick (33 mm) optical pane, and an external thermal pane. The windows were tinted with the same ink used to make American banknotes. The Space Shuttle orbiter had three sets of landing gear which emerged downwards through doors in the heat shield. As a weight-saving measure, the gear could not be retracted once deployed. Since any premature extension of the landing gear would very likely have been catastrophic (because it opened through the heat shield layers), the landing gear could only be lowered by manual controls, and not by any automatic system. Similarly, since the Shuttle landed at high speed and could not abort its landing attempt, the gear had to deploy reliably on the first try every time. The gear were unlocked and deployed by triple redundant hydraulics, with the gear doors actuated by mechanical linkages to the gear strut. If all three hydraulic systems failed to release the landing gear uplocks within one second of the release command, pyrotechnic charges automatically cut the lock hooks and a set of springs deployed the gear. During landing, the Shuttle nose wheel could be steered with the rudder pedals in the cockpit. During the construction of Space Shuttle Endeavour, an improved nose wheel steering system was developed which allowed easier and better nose wheel steering. After Endeavour's roll-out, the system was installed on the other shuttles except Challenger, during their overhauls in the early 1990s. The Space Shuttle orbiter did not carry anti-collision lights, navigational lights, or landing lights, because the orbiter always landed in areas that had been specially cleared by both the Federal Aviation Administration and the Air Force. The Orbiter nearly always landed at either Edwards Air Force Base (California) or at the Kennedy Space Center Shuttle Landing Facility (Florida), although one mission – STS-3 – landed at the White Sands Space Harbor in New Mexico. Similar special clearances (no-fly zones) were also in effect at potential emergency landing sites, such as in Spain and in West Africa during all launches. When an orbiter landing was carried out at night, the runway was always strongly illuminated with light from floodlights and spotlights on the ground, making landing lights on the orbiter unnecessary and also an unneeded spaceflight weight load. A total of 26 landings took place at night, the first being STS-8 in September 1983. The Space Shuttle orbiter ranks second among the world's first spaceplanes, preceded only by the North American X-15 and followed by the Buran, SpaceShipOne, and the Boeing X-37. The typeface used on the Space Shuttle Orbiter was Helvetica. The prototype orbiter Enterprise originally had a flag of the United States on the upper surface of the left wing and the letters "USA" in black on the right wing. 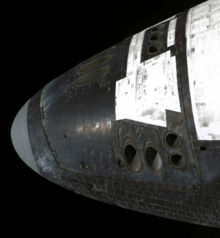 The name "Enterprise" in black was painted on the payload bay doors just above the forwardmost hinge and behind the crew module; on the aft end of the payload bay doors was the NASA "worm" logotype in gray. Underneath the rear of the payload bay doors on the side of the fuselage just above the wing was the text "United States" in black with a flag of the United States ahead of it. The first operational orbiter, Columbia, originally had the same markings as Enterprise, although the letters "USA" on the right wing were slightly larger and spaced farther apart. Columbia also had black tiles which Enterprise lacked on its forward RCS module, around the cockpit windows, and on its vertical stabilizer. Columbia also had distinctive black "chines" on the forward part of its upper wing surfaces, which none of the other orbiters had. Challenger established a modified marking scheme for the shuttle fleet that would be matched by Discovery, Atlantis and Endeavour. The letters "USA" in black above an American flag were displayed on the left wing, with the NASA "worm" logotype in gray centered above the name of the orbiter in black on the right wing. Also, the name of the orbiter was inscribed not on the payload bay doors, but on the forward fuselage just below and behind the cockpit windows. This would make the name visible when the orbiter was photographed in orbit with the doors open. Challenger also had black tiles on the tip of its vertical stabilizer much like Columbia, which the other orbiters lacked. With the end of the Shuttle program, plans were made to place the three remaining Space Shuttle orbiters on permanent display. NASA Administrator Charles Bolden announced the disposition location of the orbiters on April 12, 2011, the 50th anniversary of the first human space flight and the 30th anniversary of the first flight of Columbia. Discovery went to the Smithsonian's Steven F. Udvar-Hazy Center, replacing Enterprise which was moved to the Intrepid Sea, Air & Space Museum in New York City. Endeavour went to the California Science Center in Los Angeles arriving on October 14, 2012. Atlantis went to the Kennedy Space Center Visitor Complex on November 2, 2012. Hundreds of other shuttle artifacts will be put on display at various other museums and educational institutions around the US. The cargo bay is 60 feet long (18.3 m) by 15 feet wide (4.57 m), and could transport 53,800 lb (24,400 kg) to 127 mi (204 km), or 27,600 lb (12,500 kg) to the ISS at 253 mi (407 km). The most massive payload launched by the Space Shuttle was the Chandra X-ray Observatory in 1999 at 50,162 lb (22,753 kg), including its Inertial Upper Stage and support equipment. The Shuttle was capable of returning approximately 35,000 lb (16,000 kg) of cargo to Earth. The orbiter's maximum glide ratio/lift-to-drag ratio varied considerably with speed, ranging from 1:1 at hypersonic speeds, 2:1 at supersonic speeds, and reaching 4.5:1 at subsonic speeds during approach and landing. Individual Space Shuttle orbiters were named in honor of antique sailing ships of the navies of the world, and they were also numbered using the NASA Orbiter Vehicle Designation system. Three of the names had also been borne by Apollo spacecraft between 1969 and 1972: Apollo 11 Command Module Columbia, Apollo 15 Command Module Endeavour, and Apollo 17 Lunar Module Challenger. While all of the orbiters were externally practically identical, they had minor differences in their interiors. New equipment for the Orbiters was installed in the same order that they underwent maintenance work, and the newer orbiters were constructed by Rockwell International, under NASA supervision, with some more advanced, lighter in weight, structural elements. Thus, the newer orbiters (Discovery, Atlantis and Endeavour) had slightly more cargo capacity than Columbia or Challenger. The Space Shuttle orbiters were assembled at Rockwell's assembly facility in Palmdale, California, at the federally owned Plant 42 complex. Inspiration was an actual full-scale mock-up originally built and used to test clearance and various ground operations; formerly displayed at Columbia Memorial Space Science Learning Center in Downey, California. Pathfinder was an actual full-scale mock-up originally built and used to test clearance and various ground operations; currently displayed at Space Camp in Huntsville, Alabama. Enterprise was a prototype designed to test Space Shuttle behavior in atmospheric flight. Formerly located at the Steven F. Udvar-Hazy Center, the orbiter is currently located on the flight deck of the USS Intrepid (CV-11) at the Intrepid Sea, Air & Space Museum in New York City, New York. Columbia was first launched on April 12, 1981. On February 1, 2003, Columbia disintegrated during re-entry on its 28th spaceflight. Challenger was first launched on April 4, 1983. On January 28, 1986 it disintegrated 73 seconds after launch on its 10th mission. Discovery was first launched on August 30, 1984. It flew 39 missions, and was NASA's "Return to Flight" vehicle, following the accidental destructions of Challenger and Columbia. Discovery completed its last mission, STS-133, in March 2011. It is currently on display at the Smithsonian's National Air and Space Museum Steven F. Udvar-Hazy Center near Dulles International Airport. Atlantis was first launched on October 3, 1985. It flew 33 spaceflights including the final space shuttle mission, STS-135, in July 2011. Endeavour was first launched on May 7, 1992. It flew 25 spaceflights, the final being STS-134, launched May 16, 2011. Independence, formerly Explorer, a full-scale replica of the entire orbiter at the Johnson Space Center's visitor facility, Space Center Houston, in Houston, Texas atop a Shuttle Carrying Aircraft, NASA 905. Adventure, a full-scale replica of an orbiter mid-deck and flight deck, also at Space Center Houston. America, a full-scale replica of an orbiter for an attraction of the same name at Six Flags Great America in Gurnee, Illinois and had authentic thermal tiles used in the shuttle missions. It was disassembled and removed in 2009. Resolution, a full-scale replica of an orbiter crew-compartment, originally built to house a flight simulator but later used by Kennedy Space Center firefighters to practice rescue techniques. Inspiration, bearing the same name as the test mock-up, is a full-scale replica of an orbiter formerly outside the United States Astronaut Hall of Fame. It was subsequently sold by NASA to LVX and transported to the Shuttle Landing Facility for refurbishment and modifications in 2016. ^ "Facts About the Space Shuttles". NASA. ^ "HSF – The Shuttle". NASA. Retrieved July 17, 2009. ^ Young, John W.; Hansen, James R. (2012). "Part IV. The Shuttle Era". Forever Young: A Life of Adventure in Air and Space (Kindle eBook). University Press of Florida. ISBN 978-0-8130-4281-7. OCLC 1039310141. In the design plans, we saw that the RCS would have big doors that opened outward. The problem was, if those doors failed to close, the orbiter would be lost as it was coming back through the atmosphere. I wrote a 'review item disposition' (RID) asking NASA to eliminate the outward-opening doors. ^ "Orbital Maneuvering System". NASA. Retrieved July 17, 2009. ^ Kulkarni, Nilesh; Krishnakumar, Kalmaje (2005). Spacecraft Guidance, Navigation, and Control Requirements for an Intelligent Plug-n-Play Avionics (PAPA) Architecture. AIAA Infotech@Aerospace. September 26–29, 2005. Arlington, Virginia. doi:10.2514/6.2005-7123. hdl:2060/20060019188. AIAA 2005-7123. ^ "Electrical Power System". Shuttle Reference Manual. NASA Human Spaceflight. Retrieved February 1, 2013. ^ "General-Purpose Computers". NASA. Retrieved January 18, 2014. ^ Lohr, Steve (February 7, 2003). "Loss of the Shuttle: Technology; Computers Driving Shuttle Are to Be Included in Inquiry". The New York Times. Retrieved January 18, 2014. ^ "Automotive Design & Manufacturing". NASA Tech Briefs. 40 Years of Innovations. 22 (9): 26. September 1998. hdl:2060/20110003618. ^ "STS-113 Space Shuttle Processing Questions & Answers (NASA KSC)". NASA. November 15, 2002. Retrieved July 17, 2009. ^ Fan, Linjin (January 11, 2008). "Mysterious $100 'supernote' counterfeit bills appear across world". The Kansas City Star. Archived from the original on January 17, 2008. ^ "Space Shuttle Night Landings". NASA. Retrieved July 23, 2011. ^ Helvetica (Documentary). September 12, 2007. ^ a b c Weaver, David (April 12, 2011). "NASA Announces New Homes For Shuttle Orbiters After Retirement". NASA. Retrieved April 12, 2011. ^ a b c "Shuttle Technical Facts". Tribute to the Space Shuttle. European Space Agency. Retrieved January 5, 2019. ^ Wilhite, Alan W. (June 1977). Analysis of Separation of the Space Shuttle Orbiter from a Large Transport Airplane. NASA/Langley Research Center. p. 10. hdl:2060/19770018245. NASA TM X-3492; 77N-25189. ^ a b c Jarrett, Philip (April 2012). "Rockwell International Space Shuttle". The Color Encyclopedia of Incredible Airplanes. DK Publishing. p. 336. ISBN 978-0-7566-9575-0. ^ Hale, Wayne; Lane, Helen; Chapline, Gail; Lulla, Kamlesh, eds. (2011). "The Space Shuttle and Its Operations". Wings in Orbit: Scientific and Engineering Legacies of the Space Shuttle, 1971-2010. NASA. p. 59. hdl:2060/20110011792. ISBN 978-0-16-086846-7. NASA SP-2010-3409. ^ Wade, Mark. "Space Shuttle". Astronautix.com. Retrieved January 5, 2019. ^ "Chandra X-ray Observatory Quick Facts". NASA/Marshall Space Flight Center. August 1999. Retrieved January 5, 2019. ^ Kitmacher, Gary H., ed. (August 2006). "Transportation/Logistics" (PDF). Reference Guide to the International Space Station. NASA. ISBN 0-9710327-2-6. NASA SP-2006-557. ^ Chaffee, Norman, ed. (January 1985). Space Shuttle Technical Conference, Part 1. NASA. hdl:2060/19850008580. NASA CP-2342-Pt-1; N85-16889. ^ "Orbiter Vehicles". NASA. Retrieved March 13, 2013. ^ "Atlantis (OV-104)". NASA. Archived from the original on August 25, 2011. Retrieved March 13, 2013. ^ "Challenger (STA-099, OV-99)". NASA. Retrieved March 13, 2013. ^ "Columbia (OV-102)". NASA. Retrieved March 13, 2013. ^ "Discovery (OV-103)". NASA. Retrieved March 13, 2013. ^ "Endeavour (OV-105)". NASA. Retrieved March 13, 2013. ^ "Enterprise (OV-101)". NASA. Retrieved March 13, 2013. ^ Siceloff, Steve (December 15, 2009). "Builder's 'Resolution' a Labor of Love". NASA. ^ Pearlman, Robert Z. (April 29, 2016). "Replica on the runway: Mock orbiter lands on real space shuttle strip". collectSPACE. 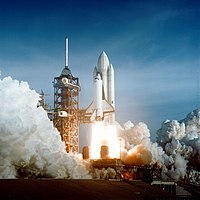 Wikimedia Commons has media related to Space Shuttles.